Genesis Today’s Pure Black Raspberry is a potent, nutrient-dense superfood packed with antioxidants, anthocyanins and ellagic acid. Antioxidants help to scavenge and neutralize the free radicals associated with premature aging, inflammatory and cardiovascular problems. The powerful anthocyanins that give black raspberries their deep, rich color have been shown to support immunity, anti-inflammatory processes, vision health, improved memory and healthy blood pressure levels. The phenolic compound known as ellagic acid is a known anti-viral and anti-bacterial; it also supports the elimination of free radicals and detoxification of the body. 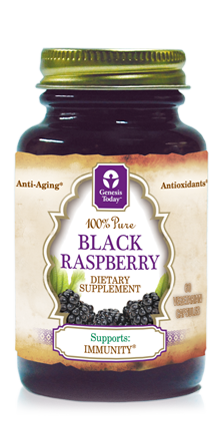 Genesis Today's 100% Pure Black Raspberry supplement is packed with ellagic acid, a known anti-viral and anti-bacterial compound which makes it an excellent way to improve your body’s own immune function. Black raspberries are rich in antioxidants and have an extremely high ORAC (Oxygen Radical Absorption Capacity) rating: about three times that of blueberries. Powerful anthocyanins support immunity and healthy cellular processes. These nutrient-rich berries contain high levels of antioxidants that help scavenge and neutralize free radicals associated with premature aging, inflammatory and cardiovascular problems. Ellagic acid is a powerful antioxidant found in black raspberries that supports the elimination of harmful by-products and detoxification of the body. Is Genesis Today's Pure Black Raspberry gluten-free? Absolutely! In addition to being gluten-free, Genesis Today's Pure Black Raspberry is also plant-based, vegetarian, soy-free, and sugar-free. Why are black raspberries so healthy? Black raspberries are a healthy addition to any diet because of their powerful antioxidant properties, which help strengthen the body. Antioxidants scavenge and neutralize free radicals, harmful by-products produced by the body. Free radicals are linked to premature aging, cardiovascular disease, inflammation, skin damage and more! Black raspberries also contain anthocyanins, which support healthy eyes, vision, cardiovascular function, blood pressure, and memory. Ellagic acid is a known anti-viral and anti-bacterial compound that supports your body’s immune function.